Today, I wanted to chat about an issue that so many children struggle with, whether they have sensory processing needs or not. 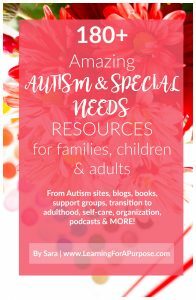 Colleen from The OT Toolbox has created yet another amazing resource to share with you and it is all related to attention and focus! *This post contains affiliate links. There is no extra cost to you, but we may earn an income. Please see our disclosure statement for further details. Attention is a big challenge for kids. Distractions occur in the home, community, classroom, and everywhere a child goes! When attention interferes with learning, performance of functional tasks, or creates unsafe situations, it can be a real problem. But did you ever stop to think about how attention is so very related to sensory processing? Our children with sensory challenges know the struggle of inattention. Parents, teachers, and therapists know that sensory processing challenges interfere with a child’s ability to attend. They may be so focused on a specific sensory input or need that they don’t notice when someone has called their name. Or, they may be so fearful in anticipation of a light touch that they miss what’s happening right in front of them. 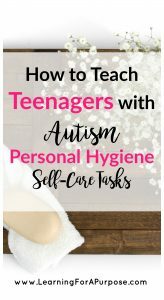 As a parent, teacher, or therapist working with these children, we can find it difficult to address the underlying needs so that a child is able to pay attention to their classroom, or to a passing car. We need to figure out strategies that meet the child’s needs in motivating and natural ways within the environment. Lack of attention span and undesirable responses to sensory input can lead to frustrated teachers, and challenged parents. Distractions from external and internal stimuli can lead to responses that look a lot like behaviors. What if we could treat the underlying issues, resulting in increased focus and attention? 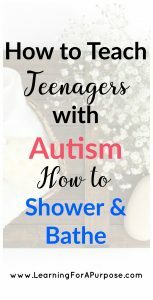 That’s where the Attention and Sensory Connection Workbook can help. It’s a one-stop spotfor information on the basics of how attention is related to sensory processing. It provides tips to boost attention through the senses so that kids can learn, focus, and pay attention when they need to. 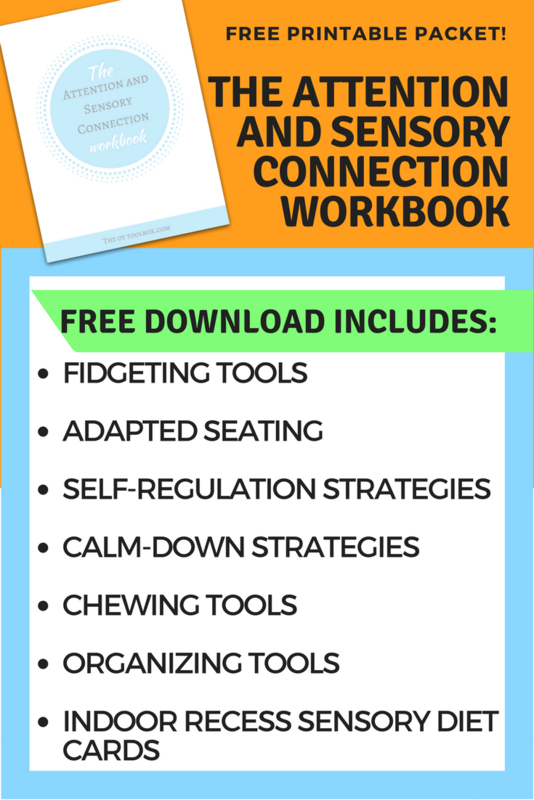 The workbook covers information about how impaired sensory processing relates to attention issues in a variety of ways and provides movement and sensory-motor activities that can help boost attention. There are specific activity ideas and tactics to address attentiveness. 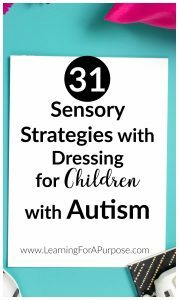 You’ll also find workbook pages that can be used to identify underlying sensory-related areas that impact attention and tools for addressing those needs. This is an ideal tool to add to any sensory lifestyle! It’s been found that there is a co-morbidity of 40-60% of ADHD and Sensory Processing Disorder. 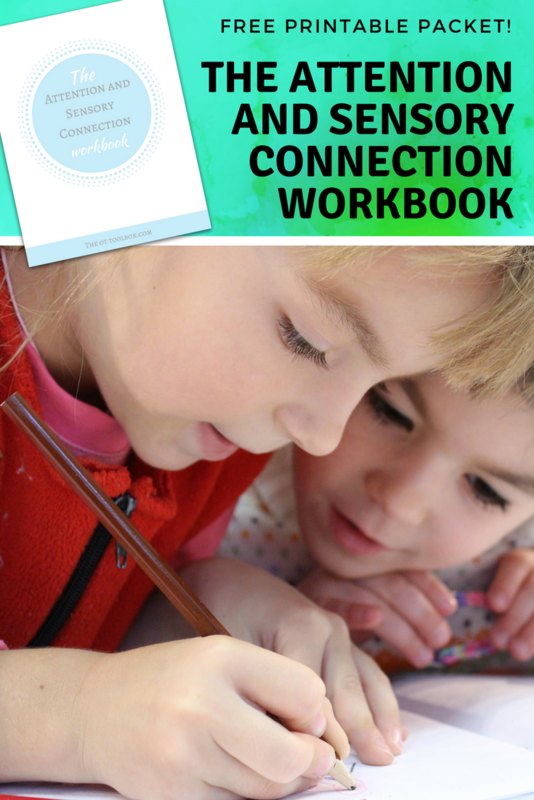 This workbook is an actionable guide to help teachers, therapists, and parents to help kids boost attention and focus in the classroom by mastering sensory processing needs. You will find information on the sensory system and how it impacts attention and learning. There are step-by-step strategies for improving focus, and sensory-based tips and tricks that will benefit the whole classroom. 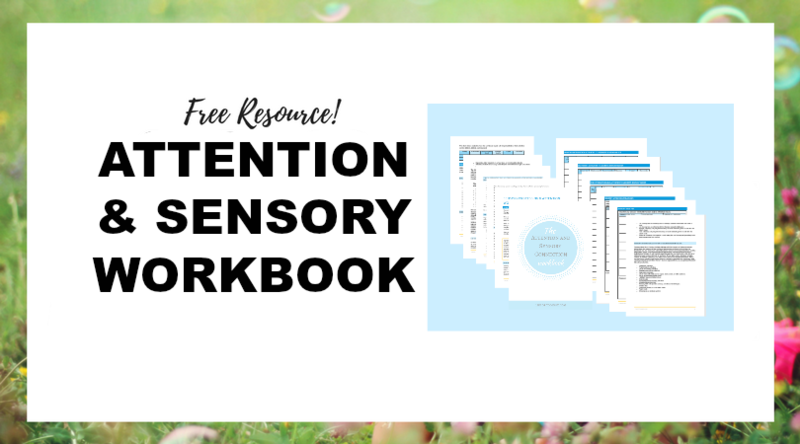 Don’t forget to grab your Free copy of The Attention and Sensory Connection Workbook!